Community garden essentials: plants, enthusiastic volunteers and a nice mulch of money! That was 3 June. 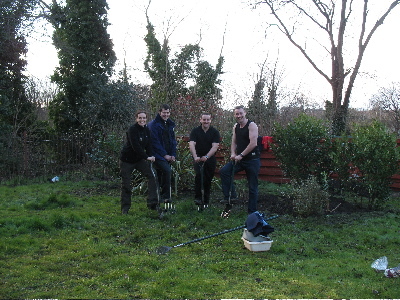 Since then Redbraes Residents Association and volunteers of Redbraes Community Garden have had more good news. Leith Neighbourhood Partnership will cover the cost of building paths in the site now being developed as a community garden. “I would like to say a huge thank you,�? says Simon who, as the local community police officer, has played an essential part in helping to create the vision for a community garden among the houses of Redbraes housing estate. The £10,000 grant from the Breathing Places programme of the Big Lottery Fund means that vision now becomes reality. Since our report last month, garden designer Becky Govier, has also had offers of voluntary help to dig and plant up the beautifully peaceful area of ground rolling down to the Water of Leith. Now over to Simon to explain why the garden is so important: “The £10,000 grant will allow us to create a true community resource in the centre ofEdinburgh. The garden project, with its focus on community involvement will influence how the local community interact with each other and their natural environment. “Education is a crucial part of our aims and the design by Becky Govier of Greenedge Garden Designs has cleverly incorporated an outdoor classroom which will double as a meeting place. The ability to grow healthy foods will be available to young children through our work with local nurseries, schools and youth groups and the garden’s design will allow all members of the community to work and socialise together. “The garden will become a focus for community social events but also provide a quiet place for people to work, exercise or simply take some fresh air in beautiful surroundings.�?